I really had a great time making projects for Ranger's booth at CHA this summer. Patti is so wonderful to work with. So when she asked me to write a few tutorials for the Ranger blog, I was hoping this would be one of them. You can find all the details and the blog post here. The Perfect Pearls Mists are all over this piece! A great place to try your hand with the newer Picket Fence Distress Stain as well. When I got home from Ankeny, there was a great package from Joy and Inspiration Emporium!!!! YES, I have the Butterfly Tote, Tissue Wrap (really cool), and Julie Balzer Templates, Halloween Adornments, Christmas Adornments, plus much, much more!!!! I got the 7Gypsies Shadowbox Tray at Memory Bound. And I guess I've been making it hard for people to read my blog with all the colors I've been known to throw in....sorry about that. I think it's only a problem when I use really light colors....we'll see. So I guess I'll have to make it mostly plain old black and white type from now on. You know what I tell you in my classes...."I WANT YOU TO BE HAPPY!" Doing the Happy Dance-Published! And more class pics! 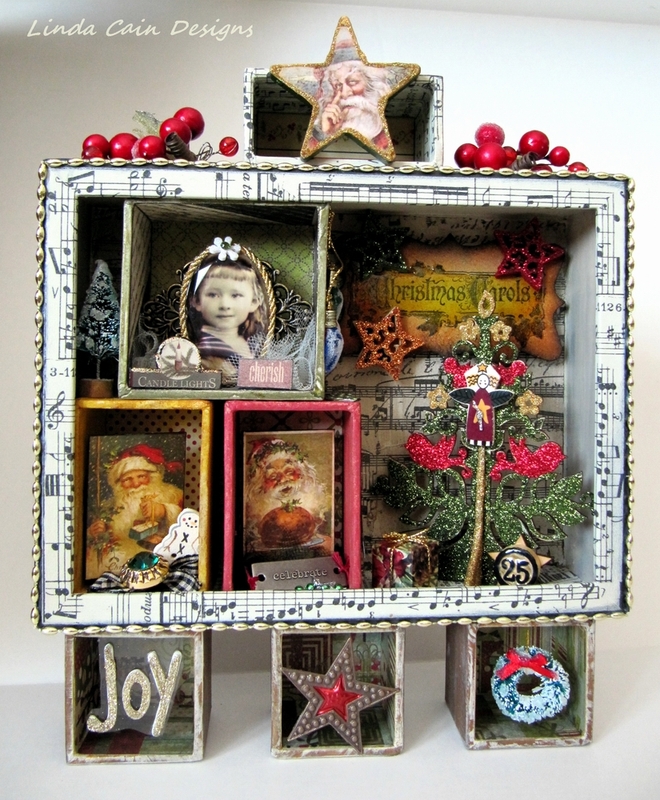 There's a teeny tiny picture of my Christmas Configuration in the new Cloth Paper Scissors publication. Even so, it makes my day! Here's a bigger picture of the piece. I used lots of different company's products here, that's what makes it so much fun. But most everything is from Tim Holtz and Ranger. Dig out all the STASH! This was a new duo in my classes. Here's Carolyn and she's checking out her bosses work! I think they had a good time and completed a really nice couple of canvases!!! Karmen and Janet busy creating. There's Kelly in the background...so cute!!!! My good bud Wanda. Such a fun and talented gal!!! 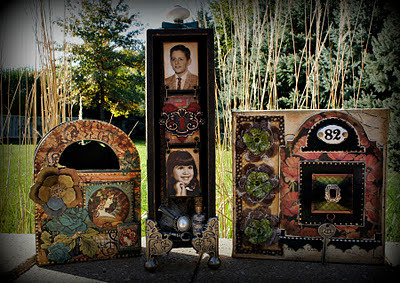 Then I had to show you the picture of Leslie's finished Standing Curio. She brought it back to class on Sunday.....VERY, VERY, COOL! 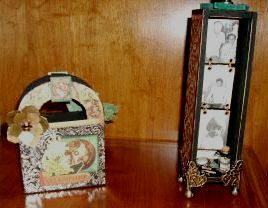 These are pictures of her Grandparents I believe. Turned out fantastic, Leslie!!! It's Taco Night at our house with the Little Kids. Will have to catch up on all the weekend fun they had while we were gone. Soccer goals....Erin's 1st Haunted House experience....Emma's tooth coming in maybe...who knows! 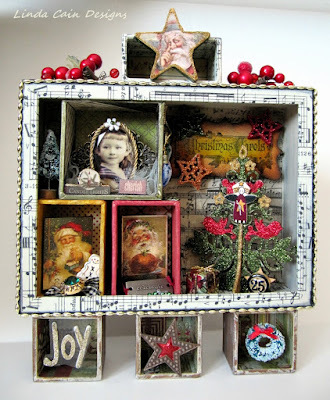 And just a note....I only have 3 Standing Curio Kits left ($31+shp)...that's all! When they're gone, they're gone.So if you want one, please let me know as soon as you can! I have more of the other class kits left. UPDATE: They're gone! The Curios...thanks everyone! Sorry this has to be said 1st! Two classes down and one to go!!! And I think everyone had a good time, learned a few things and went home with projects they really loved. The ones with their own pictures were just too cool! I did not get pics of the finished ones...so if anyone sends me pictures, I'll upload them. BUT, I did get a few pictures of the gals in class....all so talented, and helpful to each other. These 3 hard workers had fantastic Curios. Leslie helped a lot, too. And Josephine was a treat to have in class. It was the 1st time I'd met her, and she did a wonderful job with her project. The little lady in the back, was new to my classes too, I apologize for not remembering her name. She had a ton of tools, and was soooo organized. Love how her project came together! I am terrible with names. I don't remember all of them, but these 2 I DO remember. Heather and Mary!!! Good luck at the Soccer Games tomorrow! And this young lady is soooo talented. Tami, thank you for wearing your name tag, but I remembered it without looking!!! These 2 gals are a hoot! They shared all their stuff and helped each other and those around them. That is always great to have in class. Thanks Shawn and Julie!!! And here is Ms. Wanda...soooooo talented and helpful, too. Just a peach to be around. Big hugs, girl. And now these 2. There are no words to describe the fun they had and gave to all of us. We even sang an "oldie but goodie" for the class! Jackie won one of the DOOR PRIZEs, a set of G45 Christmas stamps. I believe that made her happy. Thank you Marlene for TRYING to keep her under control...the emphasis on TRYING! ﻿And this person came incognito! We've no idea who she is. She didn't want to be recognized so we'll just leave it at that. But she did have a great project she made and didn't even mind sharing her drink! So that's it for today. All in all, a wonderful time!!!!! I'll have one more class tomorrow, and be headed home. Thanks so much to Kelli and Dawn for everything. And to all the students, from the bottom of my heart, a great big thank you and a hug. Your Friend in ART....signing out from Ankeny Iowa....Good Night! 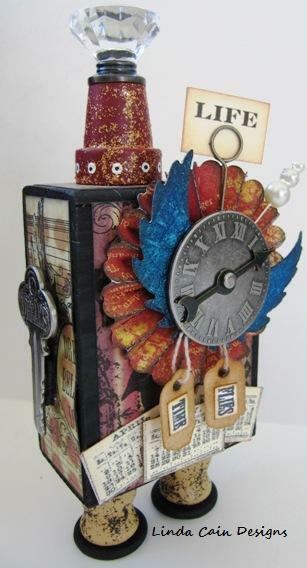 Memory Bound Scrapbook Classes this weekend! Just got an email from Dawn. If you'd like to take the classes this weekend....they have some spots open. Here are the classes for you to pick from....they were a ton of fun in Elmhurst. There will be Graphic 45 door prizes and these are great for Christmas gifts to duplicate! 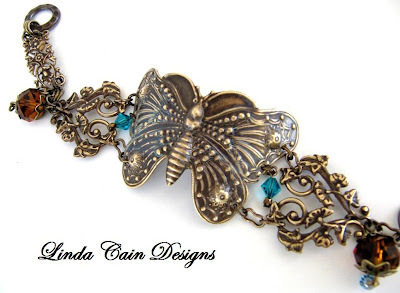 LINDA CAIN is teaching three new classes this weekend! Students loved her classes the last time she was here. We still have openings if you'd like to join her and learn many new techniques. Click here for all the info here. Gotta go paint a tarp for the Marching Band....sorry for the short post! Pondering Petunia Tag-And the WINNER! Well, it was really fun reading all the posts. I wish everyone could have won, but the magic number picked belonged to CHAR! The new magazine sounds interesting. It would be fun to win it, and the kit is adorable. Thanks for this chance to win. So Char, send me your address and we'll get that prize kit out to you this week before I head to Ankeny, Iowa. Yep, I'll be at Memory Bound for classes this weekend. Hope to see you there! Looking forward to seeing all my wonderful friends again!!!! When I was in Elmhurst at Creative Cuts and Crafts...I snagged some stamps from the delightful Dyan Reaveley. This set is Pondering Petunia. I used Distress Stains... Pine Needles, Dusty Concord, Mustard Seed, and Barn Door on a #8 Manila Tag. 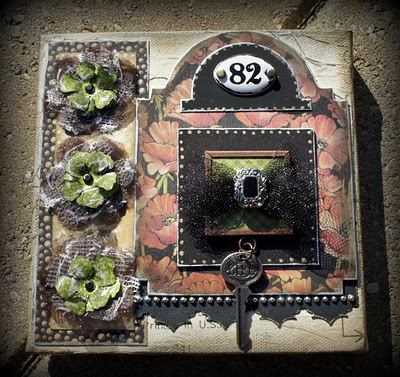 Then I used Julie Balzer's template to add the chicken wire, stars, and dots with paint dabbers, Pitch Black and Malted Milk. They just got a TON of templates in at Inspiration Emporium from The Crafter's Workshop here. 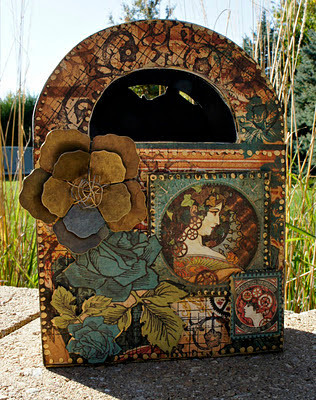 And $5 shipping within the U.S.
Oh, and the Tim Holtz District Market totes are in there, too ! I added Little Labels stamps from Tim. And of course some Distress Inks here and there....can't work without DISTRESS INKS!!!! Stamp the hand and Petunia on manila cardstock and cut out. The TomBow markers added all the color to Petunia. Her hair, that turned out great, is Sticky Back Canvas from Claudine Hellmuth. It's leftover from another project I painted and sprayed. I just frayed it out and it worked great for my Punky Lookin' Gal. Boots, Glasses and Lipstick are all highlighted with Turquoise, Burgundy, and Tiara (Glitz) Stickles. Layer it onto some black chipboard, add some pen marks, and add cutouts with pop dots for dimension. That's it for today. Kits are all packed and ready to go. Going to go sit on the sunporch, read the Help, drink coffee, and watch the leaves fall. Be well, and be good to each other. We're all we have that matters. Erin Elizabeth and I at WICKED.....she loved it. And that made my very, very happy! The publishers of Somerset Studio, Somerset Home, Artful Blogging, Art Journaling, Belle Armoire, and many more, have decided to come out with a new type of magazine–Mingle. I was asked to do a review of the new publication from Stampington, and I must tell you, it is glorious! I don't think I've seen a publication that quite captures the essence of a gathering of Artists as beautifully as the pictures found in this magazine. They speak to me. 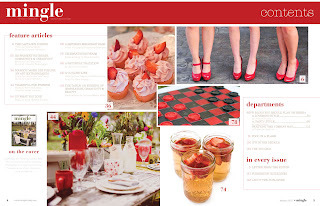 The tag line, “Creative Ideas for Unique Gatherings” is perfect for this fabulous collection of recipes, ideas, articles and the most wonderful photographs you can imagine. They take you into the celebrations and retreats, the kitchens and shopping trips, the weddings and renewals, with Artists and people in all walks of life, trying to capture the essence of friendship. And they were extremely successful. The thing I loved was the advertising, what small percentage of the pages it takes up, is all in the back of the magazine. Nothing interrupts you from a non-stop journey through the entire publication. You can sit back, relax and enjoy the entire trip through all the articles. "The much-anticipated premiere issue of Mingle is finally here! Readers will delight in all the fun and unique ideas for gathering and celebrating we've put together. From a Thankful for Friends party thrown in the woods to extraordinary tips for hosting exceptional gathering with a creative flair, we're hoping to inspire you to find more reasons and ways to celebrate. This issue also explores two intimate artistic retreats - Pen & Paper: A Be Present and Do What You Love. There's so much eye candy in this issue you won't want to miss is." So, if you’d like to win a copy of Mingle just leave a comment here on the blog. I'll throw in another PRIZE. A Chunky ATC kit for fun!!! You have to leave the comment on the blog....not on FB....OK? If you already took the ATC class, you can make one for a friend! We’ll have a drawing next week for the winner. I LOVE these projects from Maria!!! I had the pleasure of having Maria and Patty in my classes at Creative Cuts and Crafts. They had so much fun sitting and talking, creating, and relaxing in their own creativity. Fun, talented and beautiful ladies to be around. These are the projects Maria put together with her very own brilliant touch. And here's her Toolbox she put together. Great accents and check out the twisted wire she used for the flower center. Brilliant!!!!! She also used metallic pen marks that really set her pieces apart from the others. I love what she created. Please check out her fantastic blog and leave her some love here. Great time at CCC in Elmhurst! It's been awhile since I blogged. The weather here has been unbelievably gorgeous. Bill and I had a really nice trip up North this weekend where I taught to some of the finest people I know!!!! Creative Cuts and Crafts is the best place to have fun! It's in an area with a Bakery next door....so Claudia, bless her heart comes in with 2 big boxes of rolls! And Linda, well you can't say enough nice things about Linda. Brilliant ARTIST and just an outstanding host! There's always food and drinks to keep us going. The local places for lunch are great and the bike path is a beautiful place for Bill to walk off the roll and coffee he had. What can I say about how the classes went?.....being this was the "virgin" class, first time taught is always a little edgy! BUT where else would I rather go to teach this V class than my friends at CCC? They are soooooooo great!!!! And I think I can say, they went off without a hitch! YAY! I was so busy the whole time chatting or "working the room" that I didn't take a single picture! But Linda P, my proofreader friend....she used to do it for a living.....graciously sent me a picture of her finished pieces from 2 classes!!!! She used her own photos, most people did, and it turned out fantastic!!!!! You would not believe the great pictures they brought to put in their Standing Curios! It was amazing to hear the stories that went with each one. Great time with old friends, and met some amazing new friends, too. And the Graphic 45 door prizes....Christmas stamps, metal flowers, envelopes, etc seemed to make a few people smile as well. Thanks to Linda and Claudia for all the wonderful help....worth a trip from anywhere! And thanks to all the students who just help each other out, who sent emails or FB comments to tell me they had a good time and loved what they made. .......no whammies and smiling faces is the best you can ask for, and I think we got that! Thursday Erin and I get to see WICKED in Peoria!!! I've seen it before with Michelle in Chicago, but we're really lucky to have it come to Peoria this year. Should be Great!!! On to Ankeny, Iowa Memory Bound next week!!!! LOVE, LOVE, LOVE going there, too! The same kind of people who just have a great time and help each other enjoy the classes! I'll try to remember to take some pics! I was so impressed with Jess's fantastic bracelet using the large Butterfly, that I had to try one for myself. You can see hers called Enchanted Path here. Curving the pieces and adding the the jumprings to new holes that you punch with a 2 hole screw punch made for a challenging engineered project. I am not a jewelry artist, so I struggle with the concept of getting it all to lay right, and at the same time, look fairly nice....and FIT! The main pieces are found on this page @Vintaj. 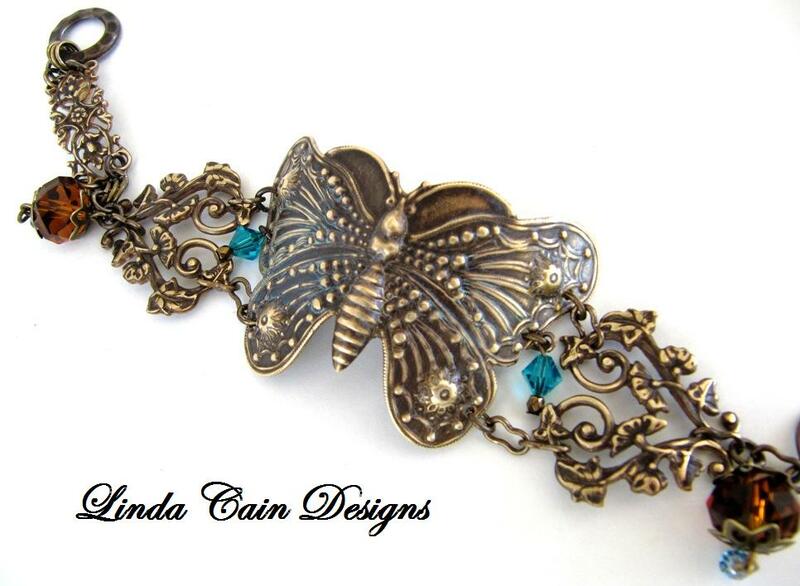 I used the Acorn Leaves on the back, the Butterfly Grandeur for the main piece, and the Deco Vines Filigree cut in half. All were sanded and polished with the outstanding Metal Reliefing Block. It makes a world of difference in the contrasting of the pieces. You can really see what it does here in this detail. So find some great pieces and play with them. I got some great DecoEmboss Folders from Hobby Lobby last week. They are SOOOOOO COOL!!!! Here's a few blanks I had to emboss. Will maybe have time to put something together before I head up North to see the fantastic people @Creative Cuts and Crafts this weekend!!!! Classes are ready to go! WHOO HOO! Can't wait to see everyone again!!! It's supposed to be a gorgeous Indian Summer week. Bill can walk the bike trail out back and then hit the bakery next door.